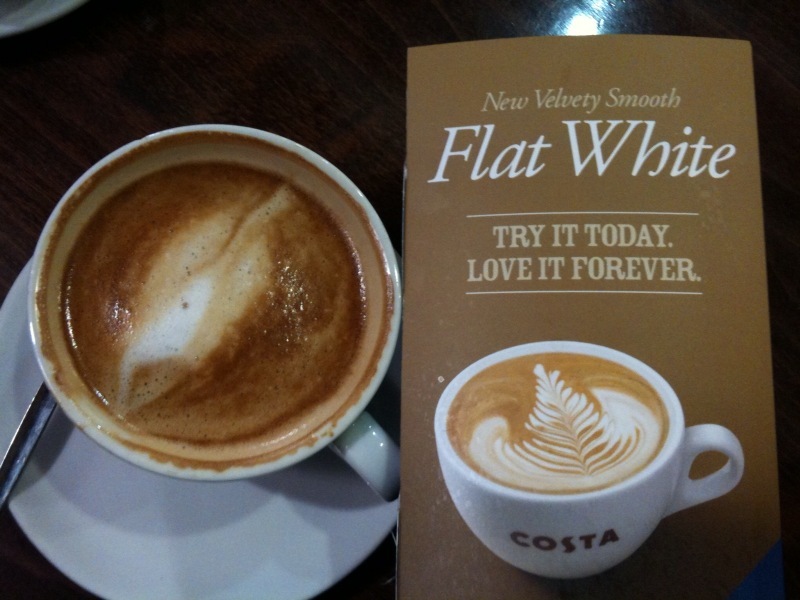 I hadn't exactly been on the edge of my seat waiting to try Costa's new "premium" coffee beverage, the flat white, not least because of Costa's habit of purveying mediocre coffee, at best. At the airport tonight when we were seeing off the brother, however, the coffee choices were limited to Costa and 'Spoons, so Costa won out. On Costa's website that says that the flat white is hand-crafted by an expert barista. Ours, it seems, was an expert barista in training as the milk was scalded and the "art" on top was more abstract than still life. Suffice to say, I probably won't be loving it forever.